The Big Dipper can serve as a key to help you navigate the heavens. These days, the stars are a little less familiar. Our skies are full of light pollution and, usually, obscured by a sturdy roof. But if you can get away from the city lights, you can still find a handful of the 88 officially recognized constellations with the help of this video guide, which allows you to look around in 360 degrees, mimicking the actual experience of stargazing. If 360-degree video isn't your thing, here are a few star-spotting tricks in written form. One of the most recognizable groups of stars for people in the Northern Hemisphere is the Big Dipper. These seven bright stars form the center of the constellation Ursa Major — Latin for "greater bear." The Big Dipper is in the northern sky, and around the world it is associated with the north. Its on the state flag of Alaska and the insignia of the North Korean army's special operations unit. Slaves fleeing the American South told each other to "follow the drinking gourd." 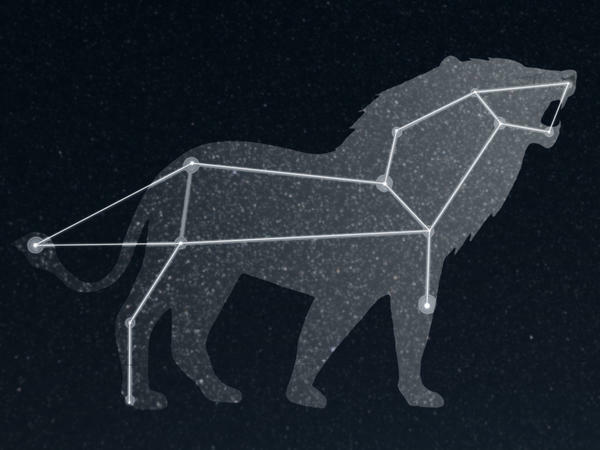 Even the word arctic is a reference to this constellation: "arktos" means bear in Greek. So as the sun sets, look to the north. In the summer months, you'll find the dipper tilted as if it's spilling its contents. Once found, these stars can be used as guides to find other constellations. 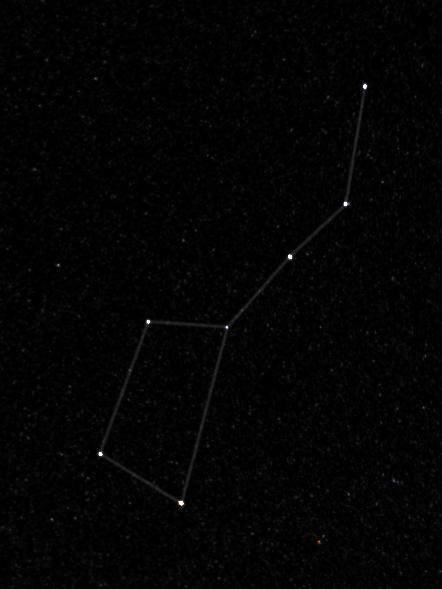 If you draw a line between the two stars at the dipper's edge and keep going, you'll hit Polaris, the North Star. Polaris is very close to the celestial pole, meaning it stays nearly fixed in the north as all other stars wheel around it. Historically, that made it a handy guide for navigators all over the northern hemisphere. Polaris is the very tip of the tail of a smaller bear, Ursa Minor. Most of the other stars in the constellation are ten to a hundred times fainter than the North Star, but you can still make out a littler dipper. Why did these bears have tails? According to the Ancient Greeks, Zeus threw them into the heavens by grabbing them by the tail, and their normally stubby appendages got stretched out in the process. If you begin at the Big Dipper, pass Polaris and keep going about the same distance again, you'll find the distinctive "W" shape of Cassiopeia. According to Greek myth, Cassiopeia was a vain queen who angered Poseidon. The sea-god chained her to a throne in the heavens. In early summer, around sunset, begin at the two stars closest to the Big Dipper's handle and follow their line into the western sky. A backwards question mark forms the mane of Leo. From Turkey to India, ancient cultures saw this group of stars as a lion, starting at least six thousand years ago. If you look up and to the east, you'll see a trio of bright stars: the iconic summer triangle. If you have trouble finding it, you can follow two stars from the Big Dipper across the sky to a star called Deneb. Deneb one of the most distant visible stars because it is so luminous — about 200,000 times brighter than our sun. Deneb forms the tail of a great swan constellation called Cygnus, and its name comes from an Arabic phrase meaning "the tail of the hen." Many stars, including the other two corners of the summer triangle, have names with Arabic roots. Between the 8th and 14th centuries, Muslim scholars in modern-day Iraq and Iran were the main keepers of astronomical knowledge. Vega, in the constellation Lyra, gets its name from the Arabic phrase "the falling eagle." Altair, in the constellation Aquila, means "the flying one." In China, Altair and Vega were seen as two lovers, a weaver and a cowherd, tragically separated by the river of the Milky Way. You'll find two more constellations floating above the southern horizon. A bright reddish star, Antares, marks the heart of a giant arachnid, Scorpius. The people of the Polynesian diaspora saw its barbed tail as the magical fishhook of the demigod Maui. Sagittarius, just east of Scorpius, is sometimes depicted as a satyr or a centaur wielding a bow. But modern viewers might more easily recognize a teapot in these stars, with the Milky Way rising from its spout like steam. Between these two constellations is the exact center of our galaxy, the supermassive black hole around which all the stars of the Milky Way rotate. Download a PDF of these navigation tips here. Follow Skunk Bear, NPR's science show, on YouTube, Facebook and Twitter.